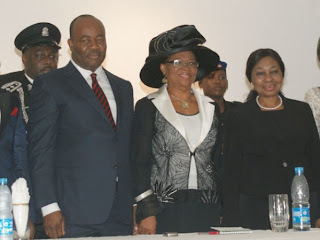 Akwa Ibom state governor, Chief Godswill Akpabio, yesterday swore in Lady Valerie Ebe as the new Deputy Governor four days after the resignation of the last occupant, Nsima Ekere. Akpabio said the swearing into office of Ebe would fast track the development of the state. The Governor spoke at the Government House in Uyo, the state capital. Akpabio said: “The change of baton in the Office of the Deputy Governor was nothing more than a shift of gear. “I believe that, everything considered, we will run faster in the pace of our development and our momentum will only increase. He advised his deputy against failure even as he paid tribute to the contributions of Lady Ebe who earlier served as commissioner in two different ministries and in a government agency. According to Akpabio, Lady Ebe’s contribution as a woman would break new grounds for the women, noting that Akwa Ibom is leading in the revolution for gender equality in the country with the swearing in of first female Deputy Governor 25 years after the state creation. Acccording to him: “The burden of being the first is that her performance and achievements will either break new ceilings for women or close the ceilings against them. She cannot afford to fail. “Though gender was not a consideration in her appointment, a section of the public would definitely see it as being at the vanguard of our faith for more women participation in governance. “By her appointment, we now have a triumvirate of women in key positions like the Chief Judge, Head of Civil and a Deputy Governor. The governor congratulated her as he recalled that as commissioner, Lady Ebe had served the state with honour, distinction, integrity and enthusiasm and enjoined her to bring those attributes to her new office, while also seeing herself as a servant, indigene of the 31 local government areas and a friend of all. On the out-gone Deputy Governor, Ekere, Akpabio acknowledged his services to the state since 2007, when he served as the Chairman of the Akwa Ibom Investment and Promotions Council, (AKIIPOC). Ebe was born on March 26, 1947 in Mkpat Enin Local Government Area under Akwa Ibom South Senatorial District and had served a Commissioner for Culture and Tourism as well as that for Environment in addition to having served as a state PDP Legal Adviser.